For security reasons, so no-one else can access your account. So other Storypark users don’t inadvertently start using Storypark logged in as you. 1. 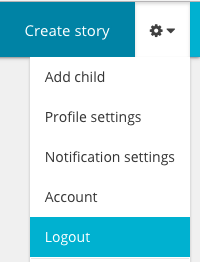 First, make sure you are on a Storypark page that has the blue panel along the top. If not, enter www.storypark.com/activity in your browser’s address bar. 2. Once you see the blue panel at the top of the screen, click the settings icon that looks like a little cog at the top right. 3. From the dropdown menu, click ‘Logout’. 4. Now, no-one can access your personal Storypark account without knowing your password.